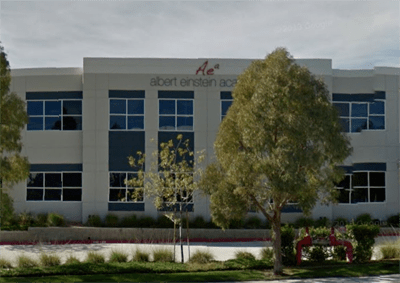 [KHTS] – Albert Einstein Academy of Letters, Arts and Sciences refused an offer of space by the Saugus Union School District Monday, which would have allowed the charter school to co-locate at Rio Vista Elementary School. AEA requested the district to provide them space on Nov. 1, under Proposition 39. The California law, passed in 2000, requires school districts to give charter schools “equal access to district facilities, if charters are able to meet certain eligibility requirements,” according to the California Charter Schools Association website. “When you have 80 or more children in a district that a charter school is providing services to, then they can request space,” said Joan Lucid, Saugus District superintendent. Saugus District staff presented a draft proposal to AEA in February and the final offer of space in March. This Charter Facilities Use Agreement would have been put to the district board for a vote on Tuesday, if AEA had not voluntarily declined the offer. Officials for the charter school did not give a reason for declining, Lucid said. AEA currently holds a K-8 charter in the Acton-Agua Dulce Unified School District, where it operates two campuses, according to their website. In March, the Santa Clarita Planning Commission denied the charter school’s plan to create a secondary school site along Rye Canyon Road, citing concerns that a school would generate too much traffic in the industrial park. As of March, AEA was also in escrow for the former Pinecrest School campus, which would meet needs for additional K-6 space, said AEA Executive Director Jeff Shapiro at the time. Shapiro could not be reached for comment as of 2:30 p.m. Monday. For more information about Albert Einstein Academy, click here. View current and past Saugus Union School District board agendas, here. Perry Smith contributed to this report. Why does Santa Clarita jump at every opportunity to make AEA look bad? Maybe they turned that down because 1. there are only two weeks left of school. Thank you, Saugus for your generous offer to give space for the last two weeks. 2. they closed escrow on the old Pinecrest location, so they’re all set for next year. Get the facts straight before just posting part of a story. Don’t understand the question. “Santa Clarita” is the city. The city has nothing to do with it. Like it says, this is a KHTS story. As an elected school board member responsible for protecting public education and taxpayer money I’d like to clarify a few things with regard to AEA. The Newhall, Saugus, Ventura and Moorpark school districts, and the LA County board of education all rejected the AEA K-6 petition due to glaring instructional and financial issues. Currently they are chartered by the Acton Aqua Dulce school district whose finances are now under county supervision due to negative budget certification. Acton receives an oversight plus an administration fee for their rubber stamp. Acton is now engaging in pay to play practices with regard to charters and AEA was the first to buy in. AEA is currently operating in a site in Acton. However, since it was not their first choice, they have made many sloppy, costly and illegal attempts at locating in the SCV. By making a Prop 39 request to Saugus for space, they caused Saugus to incur the steep costs of compliance that go along with that process. State charter law requires that in limited circumstances a charter may locate outside of the chartering district only if the district in which they locate is notified first. AEA did not notify Castaic about the Rye Canyon Site. Nor have they notified NSD of their plans to operate at the Pinecrest site. Taxpayers should be asking where all of the AEA money is coming from for the real estate they are currently holding. The Rye Canyon site can’t be cheap and it’s been sitting vacant. That site was never safe enough nor appropriate as an elementary school. How much did Pinecrest cost, and at which public meeting of the AEA Board were these matters vetted? Charters are public schools payed for with your tax dollars. Am I opposed to this type of bad actor in the charter business? Absolutley! According to public records they pay their CEO an excess of $200,000- more than any K-6 public school superintendent in the SCV and he has an incentive bonus for each school he opens. Yet, they pay their teachers less than any local district. Does this sound like a good use of your tax money? Local districts are working in concert with leaders in Sacramento to put an end to these abusive practices and waste. In the coming days pay attention to local and state media on charter schools and “pay to play” and SB 1263. Let’s stop this in its tracks! I wish they would relocate. Sorry being one that works in the industrial center where it’s located it becomes a huge cluster of traffic trying to get to work. ClickBait comes in many forms. Alicia, I agree with you. Now that its popular to be a smart nerd, the cool kids have invited AEA over to play. And Griff, have you ever been to Arroyo Seco Jr High with 1500 kids trying to get from class room to class room… It’s 10 times worse than AEA. Uh. hey Griff? It’s “through.” Who cares where AEA is? Someone teach these kids how to spell! Christy’s comments were very disturbing because of the accusations she levels at the school and its leadership. She portrays them as self-serving and unethical, which is contrary to what I know about their leadership. After speaking with Jeffrey Shapiro, Executive Director of AESLAS, I now view her comments as full of diatribe and false statements. Since when did slander become acceptable in the public arena? What public tax payers need to ask themselves is, “WHY?” Why are the districts spending their public school tax dollars to stop the education of approximately 650 students? What are they truly afraid of in the end? Did you know that every furlough to every teacher was negoitiated? It’s true. Each teacher was able to skip their teacher review process that determines whether they have been effective in the classroom as an incentive to accept their proposed furlough day. Many already ineffective teachers were able to continue to be ineffective teachers as they knew their review had been delayed, some up to 5 years. Nobody should be nuturuing children’s minds with a guarantee of employement if you have been teaching for 10+ years. Not every teacher falls into this catergory – but many do. AEA is giving parents that want more accountability from their schools a voice. This is only one of the reasons the districts don’t want Charter schools. To write such slander is an exact example of the smoke and mirrors district schools use to manipulate parents into bowing to their needs and not the children. What public tax payers need to ask themselves is, “WHY?” Why are the districts spending their public school tax dollars ear marked for education to stop the education of approximately 650 students a year? Did you know that every furlough day given to every teacher was negoitiated? It’s true. Each teacher was able to skip their teacher review process that determines whether they have been effective in the classroom as an incentive to accept their proposed furlough day. Many already ineffective teachers were able to continue to be ineffective teachers as they know their review has been delayed, some up to 5 years. AEA is giving parents that want more accountability from their schools a voice. This is only one of the reasons the districts don’t want Charter schools. To write such slander is an exact example of the smoke and mirror method district schools use to manipulate parents into bowing to their needs and not the children. Lastly, Academic levels are skewed to Demographic Areas. The Districts have determined for funding purposes it is best to have all children achieve good test scores for funding. When you lower the bar this happens. What does this mean to the child that could have reached a higher level? One should ask themselves. Why are polictis involved with our students education. If you look up the history of Districts you will see they were designed to help children. This is no longer the case. Perhaps, if the District could out perform Charters they would not have to worry about enrollment, plain and simple. AEA is indeed a badly run school. At their HS location the Founders children did not do well academically and so fired the teachers, it’s really not the teachers fault if the founders children were dumb and yet other kids (non founders) on the other hand, did well. As for their k6 school. Same thing, the founders children have all been hand picked to be in a class only for founders children whilst everyone else is dispersed with the 3 other classes. Cherry picking anyone? AEA, why are you using public funds to favor the kids that you want to and give everybody else a 2nd class treatment? Why are you always crying for parents to volunteer what I call an excessive amount of money for funding and help so that your teachers can have their own lunch hours to themselves rather than look after the kids? Why do you a k6 principal who has no clue on how to communicate with parents who are NOT founders and yet leave it to the VP to your work for you?… DR Ramsey of AEA who is Vice Principal, go take your talents elsewhere, You are wasted in that pigeon hole. AEA, have you given all your teachers much need tables for them to do their work on rather use the floors? Have you sorted out the every day bullying that goes on inside the bus? Are those parents still volunteering to be everyday chaperones to and from the church and vice versa? Why did you mislead those poor families into thinking rye cyn would be the school location and yet moved it to agua dulce and acton? Why are you having parents to shoulder the cost of transportation when you are supposed to be a private school? errr ooops, I meant PUBLIC school. You are using the public school umbrella to run your uncercover operations to give your favored kids a free education. I and a bunch of other parents were there to see it. I hope word gets out even more about your scam! !